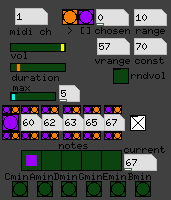 MidiLoops is a midi implementation of Tape Loops. It was made specifically to avoid working with audio files in Pure Data and instead use an external sampler to load audio without interruptions. MidiLoops is much more flexible than the audio approach, since each module can trigger several notes. Currently this is one of my main tools for soundscape performance. For ambient soundscapes as well as for thoughtful melodic passages. Particularly good to trigger sound effects and thus create a variable, naturally sounding landscape of ambience. The idea is quite simple - you give it a time range, within which it decides a random moment to trigger a note. When the note finished playing (which is determined by is duration), MidiLoops once more chooses a random moment within the defined period to trigger the note again. So what is accomplished is a non-regular sequence of notes. Additionally, each module offers 5 different notes to trigger, as well as a quick switch between scales. By combining several modules triggering different sounds at different rates, complex soundscapes and melodic lines can be generated. The signature feature of this particular method of generation is that it is capable of sounding natural as opposed to typical generated note sequences which usually give an impression of being generated rather than composed/played. MidiLoops consists of 8 modules. 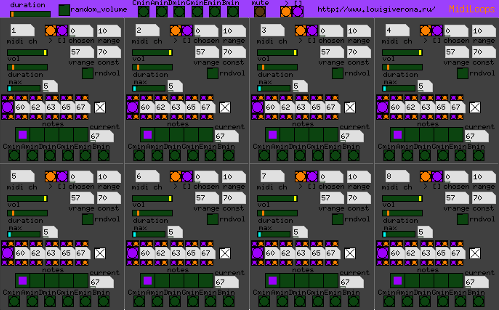 It has several controls on the top which control all the modules, but most of the work is done within each module. Let's look at one closely. vrange/const - "vrange" is the volume range within which MidiLoops has to choose a random value. "const" is the amount of volume that will be added to the random value. Put "const" to 0 if you want absolutely random volumes. scales - predefined note numbers for easier use. Remember that Amin, for instance, is same as Cmaj, so there are really 10 scales here - 5 minor and 5 major.